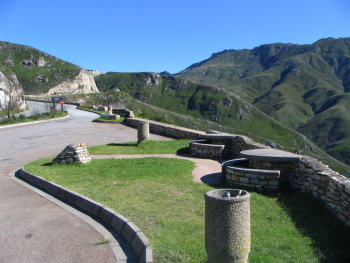 The Grootrivier Pass - (on route R102) played a significant role in the economic developement of the Cape Colony and was originally built by Thomas Bain between 1822 and 1823. 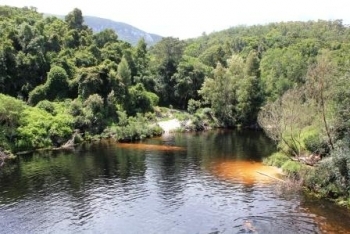 Together with it's sister pass, the Bloukrans Pass, they presented some highly technical problems to Bain, who had to contend with rockslides, mud, high rainfall, shale, unstable slopes and the omnipresent baboons. This pass is a perennial favourite and a joy to drive with its tortuous corners and stunning scenery amongst veryold forests of the Tsitsikamma. 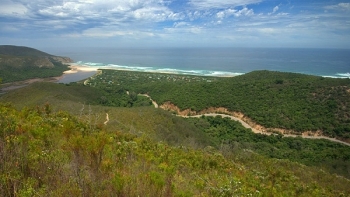 The Touw River Pass forms part of the well-known 7 Passes Road in the Garden Route and is the 4th of the official passes when travelling west to east. The road was built circa 1883 by Adam de Smidt, the brother in law, of Thomas Bain - pass builder extraordinaire. This is a gravel road and remains virtually unchanged from it's original route, with the one exception that the original timber bridge was washed away. This was replaced with a steel bridge in the 1900's. It has similar characteristics to the Kaaimansgat and Silver River passes. It's 2,5 km long and has an alltitude variance of 92m with the same inverted vertical profile typical of a pass that descends through a river gorge and rises up the other side. Of the seven rivers crossed on the 7 Passes Road, the Touw River is the biggest and the most prone to flooding. It is most likely that this pass was also built by Adam de Smidt, as Thomas Bain was held up for a long period with the contruction of the Homtini Pass, which proved to be the most difficult of the seven. 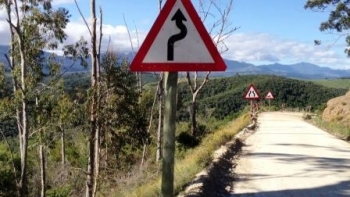 Heights Road (also known as Hoogte Road) is a short and very steep, narrow tarred road connecting the holiday village of Wilderness with the farms and residences on top of the hill known as Wilderness Heights. It is the preferred, quicker route for locals over the much longer, gravel surfaced Whites Road. Both roads terminate at the same point. 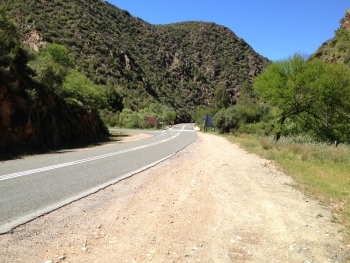 Schoemanspoort forms part of the R328 and connects Oudtshoorn with the Cango Caves. 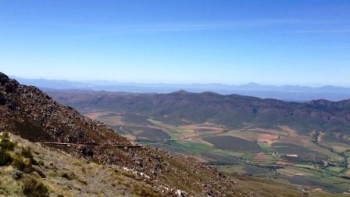 It also doubles as the feeder route to the village of Prince Albert via the fabulous Swartberg Pass. This is the lesser of the three major poorts through this mountainous region. The others are Meiringpoort and the Seweweekspoort. The pass was first in use in 1855. This poort has a bigger altitude variance than most poorts at 220m but due to the long length of just under 20 km the average gradient is an easy 1:88 and never gets steeper than 1:17. This is one of the most underrated scenic roads in South Africa and lives constantly in the shadows of it's more glamorous local attractions - namely the Cango Caves and the Swartberg Pass. The poort offers magnificent Cape Fold Mountain geology as it twists and turns along the banks of the Grobbelaarsrivier. This short pass makes up for its lack of length in providing magnificent scenery of lakes, rivers, gorges and ravines amongst dense indigenous forests and pine plantations on the higher mountain slopes. 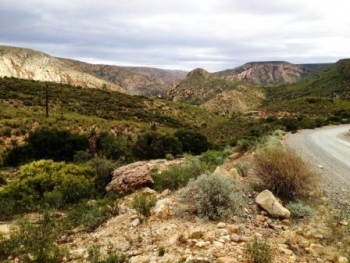 It is one of several access roads between the N2 highway and the ever popular Old Cape Road or 7 Passes Road. This one is a gem and not used by many vehicles, so it's usually peaceful and quiet as its a sort of "road to nowhere". With two good tarred roads duplicating the purpose of this gravel pass, the majority of heavy traffic opts (as usual) for the tar. This leaves the Ruigtevlei Pass in peace and quiet. The Robinson Pass on the R328 route, is a modern classic of the Southern Cape with beautiful sweeping curves and superb views around every corner. It's administrative number is TR 33-2. 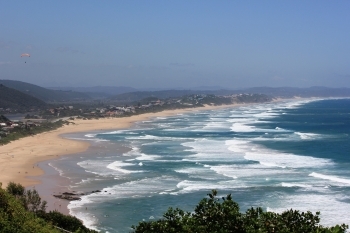 It connects the coastal port of Mossel Bay with Oudtshoorn. The pass has been rebuilt several times over the past 140 years and offers not only fabulous scenery, but many pages of history around every bend. The pass is subject to heavy rain and frequent mountain mists, which reduces visibility and makes the pass dangerous. It has claimed many lives over the years including a bus full of international tourists. A memorial stone in their memory stands on the left hand side of the road about halfway up the pass. 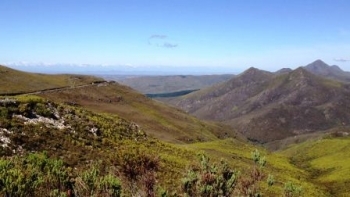 The Outeniqua Pass is a relatively modern pass, connecting the coastal town of George with Oudtshoorn and the Little Karoo. It was first built in 1942 - 1951 to provide an alternative to the narrow and steep Montagu Pass. 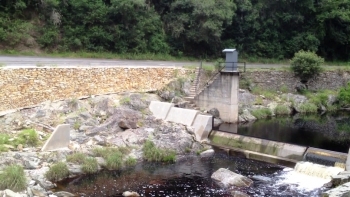 It has been widened and modernized several times since then and today carries the bulk of the traffic flow between the two towns and the Langkloof. Rockfalls and trucking accidents close the pass from time to time. The higher reaches of the pass are subject to heavy rainfall and dense mountain mists which can reduce visibility to a few metres. Under such conditions, this pass is dangerous especially due to the volume of commercial traffic that it carries. It contains 40 bends,corners and curves, many of which exceed 90 degrees. The road is well engineered, but it is advisable to stick to the speed limits have which have been carefully calculated to get you safely over the pass. For south-bound traffic there are several excellent view-sites and the third one from the summit is particularly impressive, which is marked as "The 4 passes". From this vantage point all four passes still be seen, one of which dates back almost 200 years. The pass has an altitude variance of 581m and is long at 13,3 km, producing an average gradient of 1:23 with the steepest sections being at 1:10.